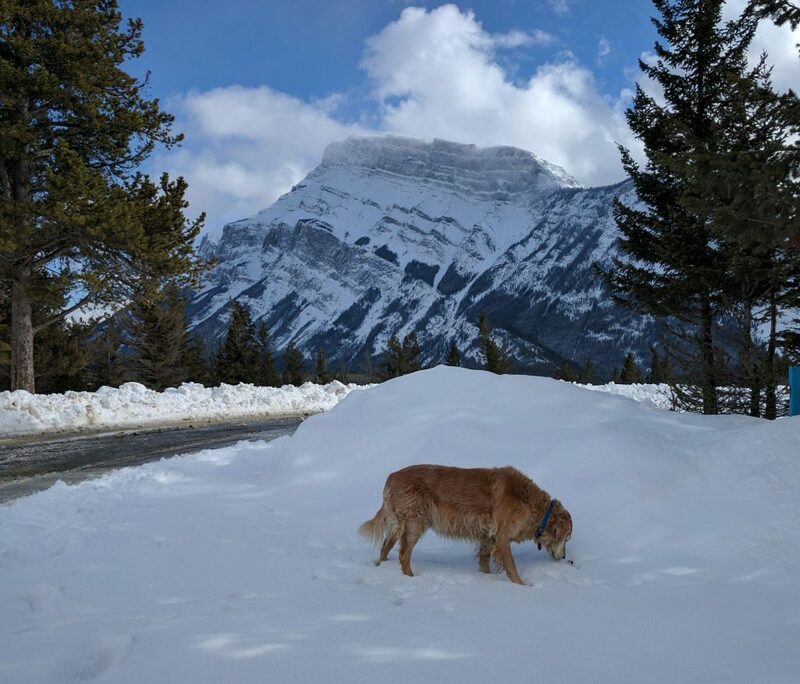 We took our annual Spring pilgrimage up to Banff and Jasper parks in Alberta. Since we just installed a Victron battery monitoring system, we decided to track electricity use carefully on this trip, and also tracked propane and water use carefully. This data may be helpful for planning your battery and tank sizes for your conversion. Also some tips on finding campsites in the winter when most campgrounds are closed. For those who have not been to Banff/Jasper Parks, its just an outstanding destination. We go at least twice a year. There is simply no better place in the world to see great mountain scenery. The only caution I would add is that it gets to be a zoo in the summer — best to go in the off season. For 2017, Parks Canada is offering a free year long pass to all Canada National Parks . As long as its in your windshield, there is no fee to enter any of the Canada parks for this year. Its celebrates their 150th anniversary. One caution is that places like Banff in the mid summer are going to be more of a zoo this summer than usual — go off season this year if you can. Since we just had our new battery monitor installed, I kept track of consumables more accurately for this trip. Hopefully this helps people doing conversions plan how big their tanks/batteries need to be. We spent a total of 4 nights in the van plus one at a motel. Our van is the 136 WB high roof, propane for heat and cooking, house battery is two 6 volt golf batteries in series — about 200 amp-hrs capacity. Night temperatures for the 4 nights were: 30F, 19F, 28F, and 22F. We drove every day, so the battery started at 100% SOC each night. Total propane usage was 9.9 lbs, or half of our 20 lb tank. This averages out to 2.5 lbs per might, or 0.58 gallons per night. The propane is used for space heating and for cooking. Our van is pretty well insulated, and we have insulated plugs for the windows. We keep the van at about 65F until bed time, and then down to about 50F for the night. The battery monitor is set to 200 amp-hrs for our two golf cart batteries. Somehow the Amp-hr readings don’t exactly line up with the SOC readings, but pretty close. Our electrical demands are: Fridge (Norcold 751), furnace blower, lights, charging devices, and DVD player. I was a bit surprised at the low electricity consumption — we could have made all 4 nights with no charging from van or solar and still been above 30% SOC. We used a total of 8.4 gallons over the 4 days (of our 18 gallon tank). Surprising how little water used. We use water for cooking and washing, and water for the big dog. We do have a composting toilet, so no water for flushing. Note how the energy used in propane is 34 times the electric energy use. This gives some idea how hard it is to do a van that is fully electric — especially in the winter. Note that this trip was basically sight seeing with most of the days spent driving. If you were at a campground all day, the usage would be quite a bit higher. The newly installed battery monitor is a Victron and it appeared to work well. It gives SOC, amp-hrs used since 100% SOC, voltage, hours of use left… Very compact and easy to use. Cost was $164. Finding a good place to camp in the winter in northern states can be a problem, as most of the campgrounds are closed until late Spring. One thing we found helpful on this trip was to use the AllStays app. They have a filter you can apply that only shows campgrounds that are open year round. Turning this filter on zeros you down to only campgrounds that are actually open in the winter. 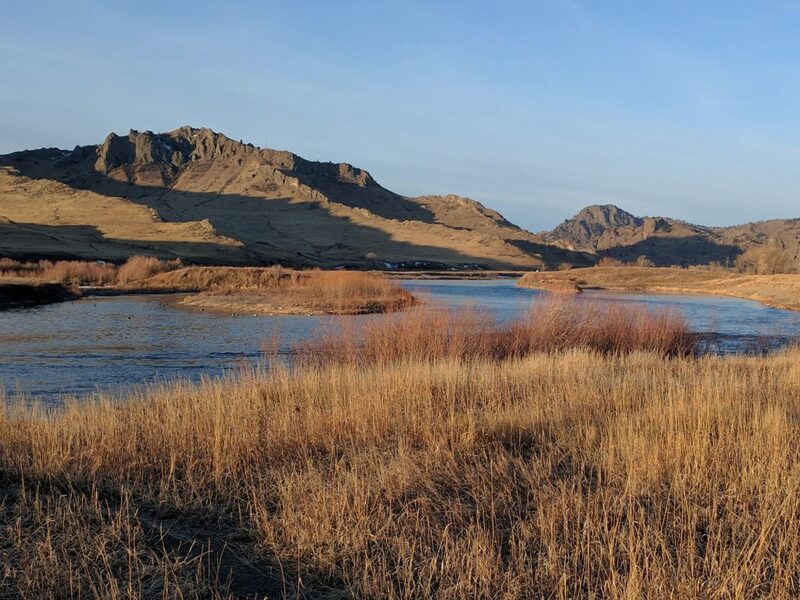 AllStays also has also has a lot of campgrounds — we found this really nice campground/Fishing Access along the Missouri River south of Great Falls — it was not listed anywhere else that we could find and no road signs off the freeway pointing to it. Lots of Canada Geese and a couple Trumpeter Swans. Winter camping and winter trips can be challenging. On this trip, even though it was “Spring” the entire Icefields Highway from Lake Louise to Jasper was closed for avalanche work for a full four days. Even on campgrounds that are open in the winter, the plowing usually does not include plowing individual camping spot locations, so you have to be prepared to get into a space that may have fairly deep snow. On other winter trips, we have managed to get stuck and were thankful for having chains and a tow cable. You should be prepared for being stuck out in the middle of nowhere for a couple days if you get stuck in a blizzard. A tow rope and knowledge of where your tow hookup points are (front and back). A bit of extra propane in the form of a couple 1 lb cans and an adapter to allow them to be used in lieu of the larger tank. Some extra food and water (which you probably have in the RV anyway). We actually carry most of this stuff year round. If I was doing the conversion over, I’d think about some simple way to keep the fresh water tank and the plumbing to the sink (including the pump) above freezing even when the van is not heated. Maybe locate the fresh water tank, pump, and sink all in the same cabinet and insulate it so it could be heated with a small electric heater that could work off the battery. The composting toilet that we use is very compatible with winter camping — no worries of toilet tanks freezing.